Situated in Melville, this motel is within 1 mi (2 km) of Melville Heritage Museum and Melville City Hall. Melville Regional Park is 1.5 mi (2.4 km) away. Situated in Melville, this motel is within 1 mi (2 km) of Melville City Hall and Melville Regional Park. Melville Heritage Museum is 1.4 mi (2.2 km) away. Service was good - when you could find someone. It took me over 15 minutes of calling and searching to get checked in. I was one of only 3 guests that night (I think) so it was very slow. Otherwise no complaints - it was clean and comfortable and I got a great night's sleep. Where to find Melville hotels near an airport? Where can I find hotels in Melville that are near tourist attractions? Planning to spend several nights in East Central Saskatchewan and would like to stay close to central Melville? About 4 hotels are located within 0.1 kilometres (0.06 miles) of Melville's center. The Classic Inn is a sought-after hotel choice because it is so handy to Melville's heart. The Howard Johnson Melville is located 1 kilometre (1 mile) from the center of Melville. Or, alternatively, the Melville Country Inn is 1 kilometre (1 mile) away. 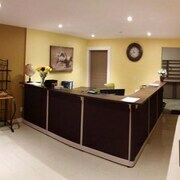 The Classic Inn and the Sigma Inn & Suites Melville are other alternative hotel options around Melville. 60 kilometres (37 miles) from Melville you'll find Esterhazy, where you can visit Esterhazy Golf and Country Club and Esterhazy Community Museum. 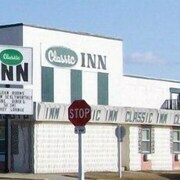 Some of our recommended Esterhazy hotel options are the Canalta Esterhazy and Western Star Inn & Suites Esterhazy. 40 kilometres (24 miles) to the northeast of Melville, you'll also find Yorkton, which is home to the Days Inn and Suites Yorkton and Home Inn & Suites Yorkton. Regardless of whether you're passing through or spending a few nights in Yorkton, set aside some time to check out the Painted Hand Casino and Deer Park Municipal Golf Course. 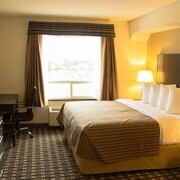 If you are traveling into or out of Regina International Airport and plan to stay nearby try The Hotel Saskatchewan, Autograph Collection or Best Western Seven Oaks Inn. Are there hotels in other cities near Melville? What other types of accommodations are available in Melville? Explore Melville with Expedia.ca’s Travel Guides to find the best flights, cars, holiday packages and more!